I am an architect specialized in restoration and refurbishment. I graduated in Architecture in Florence University in 1989 with a First Class Degree with honours and after some work experience I eventually started my own practice in 1993. 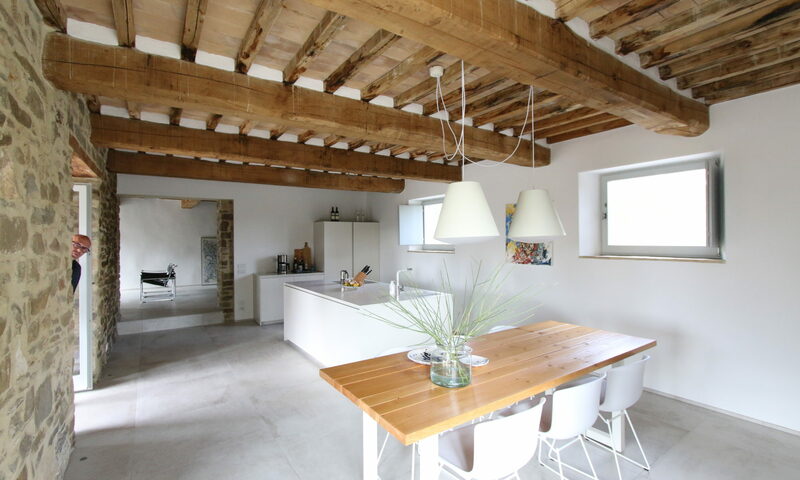 I have always been interested in restoration and re-use of old buildings, mainly farmhouses in Umbria, but also in Tuscany and throughout Central Italy. After two intensive and stimulating years of work experience in London, including at the offices of Lord Richard Rogers, in very different fields from those I currently tackle, I decided to return to my hometown in Umbria to live and work. My architecture, both for new buildings and restoration of existing ones, is ever more focused on environmentally friendly material and techniques, and methods of energy saving. Solar and photovoltaic panels, thermal insulation, underfloor heating, geothermal energy, the latest heat pumps: nowadays, these are all priorities when restoring or building a house. Lately I have designed and supervised two houses built in wood, using X-lam or CLT (cross laminated timber) technology. Quick to build, ecological, incredibly warm and dry in the winter and cool in the summer. I live in Umbertide, North Umbria, with my two children and my dog.